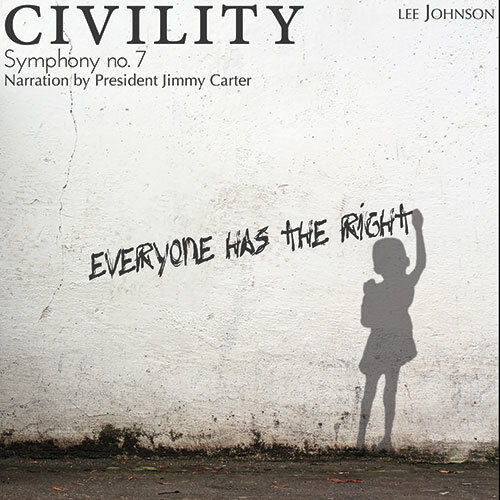 In today’s world marked with divisiveness and discord, Lee Johnson feels there is no better time for the release of his “Civility” symphony No. 7. An all-digital release, “Civility” is now available worldwide on download and streaming services. Johnson said he was approached by the nonprofit Art Reach Foundation in 2002 to go to Bosnia and Northern Ireland to learn about each country’s conflicts. Art Reach utilizes arts therapies to work with the growth and development of children who have experienced the traumatic effects of war, violence and/or natural disaster. Johnson spoke to government officials, activists, artists and residents, and was discouraged by what he found. He became convinced that the only lasting solution to those bloody conflicts would be a radical change of heart that reaches all factions. This became the message of “Civility,” he said. Later, when Johnson visited the Carter Presidential Center in Atlanta, he was introduced to the Universal Declaration of Human Rights. On Dec. 10, 1948, in Paris, the United Nations General Assembly declared the document a standard of achievements for all peoples and all nations. The UDHR would become an essential element in “Civility,” and Johnson began to seek the appropriate person to read it, a person with the appropriate moral authority. He was astonished when, after an early performance of the piece at the Carter Center in Atlanta, former President Jimmy Carter offered to be that person. President Carter said he was honored to be a part of the “Civility” project. The LC golf team placed third at the Rhodes College Fall Collegiate Classic played at the Tunica National Resort in Tunica, Mississippi. Sophomore Ben Womack tied for sixth in the individual standings. 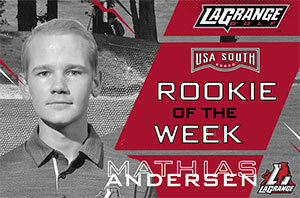 Freshman Mathias Andersen tied for 17th and was selected as the USA South Rookie of the Week. 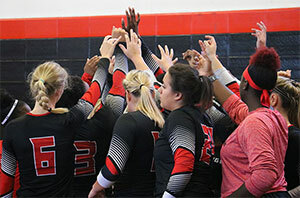 The Panthers play in the Royal Lakes/Oglethorpe Fall Invitational on Oct. 1-2. Cam Perkins rushed for 88 yards and three touchdowns to lead the Panthers (1-2) to a 42-13 win over Apprentice in Callaway Stadium last Saturday. 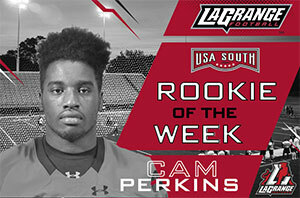 Perkins was selected as the USA South Offensive Rookie of the Week for his play. The Panthers play at N.C. Wesleyan on Saturday in a USA South game. Adam Curry and Asher Hendon each had two goals as the Panthers (4-3, 0-2 USA South) defeated Warren Wilson 6-0 in a non-conference game Sunday. The Panthers host Methodist on Saturday and N.C. Wesleyan on Sunday in USA South contests. Game time is 1 p.m. each day. 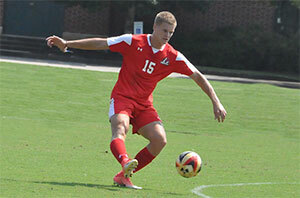 The Panthers (2-7, 0-2 USA South) lost a pair of 3-2 decisions to USA South foes Covenant and Piedmont last Saturday. Junior Leigha Reynolds had a double-double of 12 kills and 25 digs against Piedmont. The Panthers face Brevard and Maryville as part of a USA South tri-match at Brevard, North Carolina, on Saturday. Registration is open now for the 2019 3D Journey educational travel adventure to Morocco. Hosted by President Dan McAlexander and Celeste Myall, the trip will be April 27-May 8. Details and rates are available at the Office of Alumni and Community Relations, 706-880-8244 or 3DJourneys@lagrange.edu. It’s getting closer – Homecoming 2018. 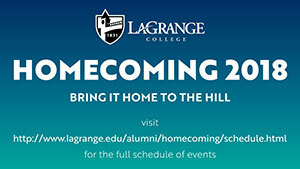 Visit lagrange.edu/alumni/homecoming for more information.